At the time of writing, a rising tide of anger is shaking Mexico. International media broadcast images of masked youths administering violent reprisals against the police, some wielding machetes, some behind captured police riot shields. The airport at Acapulco was closed down by the protestors, in Mexico City the door of the Presidential palace was set alight, and in the town of Iguala government buildings have been destroyed. As is well known, the spark instigating these events was the as yet not fully explained disappearance of 43 students. Relatives and supporters continue to hold out hope that they can be returned, but the reality is, according to the police statements of those suspected of the deed, that the students were murdered. 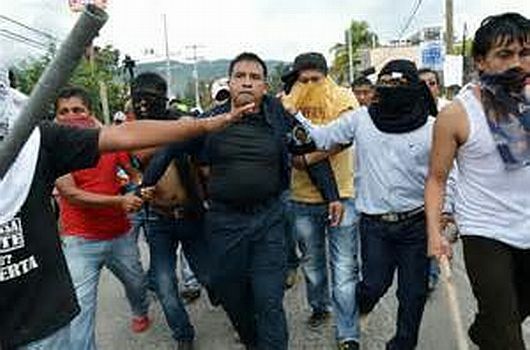 The details may yet change but the essential story seems to be established – the Mayor of Iguala’s wife, having decided to run for office following the standing down of her husband, objected to student protestors during her speeches, had the students arrested and subsequently the students, perhaps all or some are already dead, were handed over to criminal gangs for disposal. But this atrocity has not come from nowhere. Anyone with a little knowledge of Mexican history will know that Mexico’s authorities have a gruesome historic precedent to this current round of callous, corrupt, destruction of the anti-establishment student voice. In 1968 the Mexican authorities openly slaughtered a student protest in the capital city, in what is know as the Tlatelolco massacre. The machine guns which openly mowed down the students, themselves part of the global protests against the status quo as the capitalist system started to show the first signs of crisis following the post war reconstruction, sent a shockwave through Mexican society and the dream that Mexico, that year holding the Olympics, was leaving the ranks of the third world to join the first was struck a fatal blow and soon died a death. Today the situation in Mexico is much different. Long years of economic hardship have seen the collapse of the 70 plus year dictatorship of the PRI (disguised by electoral fraud, corruption and oppression) which came out of the various incarnations of the bourgeois dictatorship which was the outcome of the 1910 revolution. The illusions in democracy following the toppling of the dictatorship have also been tarnished and an exasperated population brought back the tainted PRI which today governs. However the material reality which sees a third of the Mexican population facing hunger and the cutting off of a major source of oxygen – working in the USA, legally or otherwise as that economy struggles to create employment means that in Mexico a powder keg constantly threatens to explode. Like many Latin American countries, wealth inequality is extreme. No doubt the kleptocrats in Mexico, like their homologues everywhere, have no means to resolve the capitalist dynamic which amasses a combustible pool of human misery on an escalating scale. The arrogance of the political elite in simply disposing of the opposition, the long known corruption involving Mexican state forces and powerful criminal cartels, the bleak outlook of so many who, educated or otherwise, expect little from the crisis racked economy which is a machine for exploiting the population on behalf of imperialism and its native lackeys, whilst at the same time the state is a machine for the suppression of the same class should it raise a voice or hand against its exploitation; all of this is a recipe for social disaster and a revolutionary response. Against such a background, events such as the current outrage have the potential to spark insurrectional movements. Although the current outrage may burn out, its memory will remain. Murdering of students en masse AGAIN is a huge psychological factor. The lesson of Mexico is one more piece in the jigsaw which only the universal revolutionary perspective can explain. The state in capitalist society EVERYWHERE is no neutral entity sitting above social classes offering benign, impartial protection to all citizens, great or small. The centralised state power, with its ubiquitous organs of standing army, police, bureaucracy, clergy, and judicature — organs wrought after the plan of a systematic and hierarchic division of labour — originates from the days of absolute monarchy, serving nascent bourgeois society as a mighty weapon in its struggle against feudalism. ..... At the same pace at which the progress of modern industry developed, widened, intensified the class antagonism between capital and labour, the state power assumed more and more the character of the national power of capital over labour, of a public force organised for social enslavement, of an engine of class despotism. Again at the time of writing, in the US town of Ferguson, gun shops report a tripling of gun sales in recent days, shops are boarded up with ‘OPEN’ signs sprayed on plywood, such is the expectation of widespread looting whatever the jury decide regarding the killing of a black teenager there in August. In Paris violent protests against police brutality this time over the murder of an ecological activist makes the news. Close to home in the UK , the lack of public trust in the state forces, whether police or politicians, is escalating. The memory of police oppression, whether brutality against miners or the recent admission of corruption over Hillsborough deaths confirms over and over the Marxist teaching on the class nature of the capitalist state. Today, the world over, the rich are getting richer through the exploitation of working class. In the process they are destroying the lives of billions. Whether this be the ‘jobectomy’ which sees mass unemployment or pathetic part time jobs which the average 11 year old could do, tumbling wages, the return of wealth inequalities to pre war levels which means life chances are determined by accident of birth and wealth and misery concentrate ever more, to the extreme examples of state terror and murder as seen in Mexico and elsewhere, the time is more than ripe for the revolutionary perspective. The question of power is fundamental. In the hands of the representatives of capitalists, power will be a means to suppress the working class. In the hands of the working class power will be a means to suppress the capitalists and construct socialism. By this we don’t mean the abortions of Stalinist state capitalism that have never been socialist but a society built by the working class themselves based on class wide bodies involving everyone. It is the very opposite of any system that leaves it to the powerful to exploit and manipulate us. The alternative is stark. We either continue along the path towards destruction, or we contribute to the construction of the revolutionary alternative. The Internationalist Communist Tendency rejects any claim that capitalism can be organised in such a way as to eliminate the escalating abuse of all those, chiefly the working class, who cannot hope to join the ranks of the exploiting elite. The only possible, practical response to the social question, is to develop our own class social and political organisations for the overthrow of capitalism. The Tlatelolco massacre, also known as The Night of Tlatelolco (from a book title by the Mexican writer Elena Poniatowska), was a killing of an estimated 30 to 300 students and civilians by military and police on October 2, 1968, in the Plaza de las Tres Culturas in the Tlatelolco section of Mexico City. The events are considered part of the Mexican Dirty War, when the government used its forces to suppress political opposition. The massacre occurred 10 days before the opening of the 1968 Summer Olympics in Mexico City. More than 1300 people were arrested by security police. There has been no consensus on how many were killed that day in the plaza area. At the time the government and the mainstream media in Mexico claimed that government forces had been provoked by protesters shooting at them. But government documents made public since 2000 suggest that the snipers had been employed by the government. The Mexican miracle refers to the country's inward-looking development strategy that produced sustained economic growth of 3 to 4 percent and modest 3 percent inflation annually from the 1940s until the 1970s. Mexican governments – under presidents Vicente Fox, Felipe Calderón and now Peña Nieto – have tried to present their war against the narcos as a state apparatus against organised crime. This is also the bleat of the US as it provides “aid” for the “war on drugs” while also exulting in the opportunities for “investment” in Mexico. Brita….However, for a long time the world’s bravest reporters have challenged this version of events. Mexico’s leading writers, Lydia Cacho and Anabel Hernández, received serial death threats for proving that the authorities – politicians, police, army – are synonymous with the cartels or in league with them. Others on the left have always asked, to general derision: where are the armed forces in all this? ……Lesser writers on Mexico, including myself, have insisted that the line between legitimacy and criminality, upon which Mexico’s international relations are based, is a fantasy, that the line between legality and illegality is a lie, not only within Mexico, but internationally, with regard to the laundering of the profits of crime.